Rolls-Royce Motor Cars have appointed Frank Ludwig as Director of Manufacturing, as replacement for the outgoing Jorg Bause. Mr Ludwig joins Rolls-Royce from BMW in Leipzig, Germany, where he was Director of Painted Body; Mr Bause has left Rolls-Royce for a senior position at BMW South Africa. Before first joining BMW in 2002 as General Manager, Manufacturing Body-in-White, at MINI in Oxford, Mr Ludwig worked for a small premium car company in Germany. 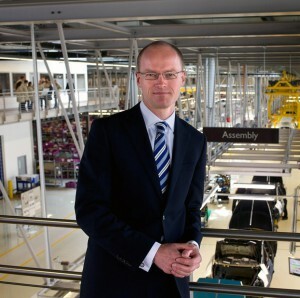 Torsten Muller-Otvos, CEO of Rolls-Royce, said: “I am delighted to welcome Frank to Rolls-Royce and to his new position heading the manufacturing team here at the Home of Rolls-Royce at Goodwood. Rolls-Royce launched their next model, Wraith – the ‘most dynamic, powerful and beautiful Rolls-Royce in the company’s history’ – at the Geneva Motor Show in March. It is currently in pre-production and customer deliveries will begin the last quarter of this year.